I have always loved to crochet. Recently, I have mindfully taken more time to crochet. As a result, my skills are improving and I've been creating things that people really enjoy. During this time I've begun to use a new yarn: Wool-Ease Thick & Quick by Lion Brand Yarns. Outside of using Bernat Blanket yarn in a couple of patterns, I've never branched out to the Bulky and Super Bulky yarns. But I stepped out of my comfort zone and I'm so glad I did. I am thrilled with this acrylic/wool blend yarn by Lion Brand. I've never been a fan of wool - with the exception of work socks that have a small percentage of wool. I love those. But anything that has a larger percentage of wool I imagine as scratchy. I don't know why, but I do. I just always assume that wool is going to be uncomfortable. During shopping trips down the yarn aisles, I am a toucher. I want yarns that feel good. 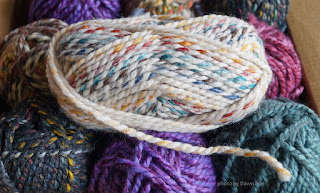 One day I touched a skein of yarn that was so thick and soft that I bought a few skeins. I did not realize they were an acrylic and wool blend yarn until I got home. Wool - Ease Thick & Quick comes in two skein sizes: a regular skein size at 5 oz (87 yards) or the bonus bundle at 12 oz (212 yards). Be aware if you are shopping online. It appears the some outlets show the regular skein size as the "bonus bundle". Be sure to read the weight/length if ordering online. It is in the Super Bulky category (which is #6 on the label). And the recommended crochet hook size is "N" (knitting needle size 13). Wool-Ease Thick & Quick is 80% acrylic and 20% wool. It is machine washable and dryable using cool temps. Do not bleach or iron. I bought this yarn as I was experimenting - trying to crochet a very small neck warmer that someone had suggested. I ended up with the wrong pattern or the wrong size yarn during my experimenting. Then I gave this yarn and a "N" hook a try. And ta-dum, I have great neck warmers that people are enjoying. If you'd like an acrylic/wool blend neck warmer and don't feel like making your own, keep your eye on my Etsy Store. I will offer these neck warmers with button closures at DawnRaeCrochet as I get them made. If you'd like to make your own scarf from this yarn, you can check out the crochet patterns on Lion Brand Yarn Company site. If you are a beginner, this "Brunch With Friends Scarfie" would be a good pattern to try. the button holes are the spaces between the DCs (making the scarf able to be worn in a variety of ways/lengths).